* Legs are cut in two parts (or chicken cut into pieces, but the backbone is spent on soup). * Wash, dry thoroughly with a soft cloth or kitchen paper, sprinkle with salt and pepper, who rubbed his hands in the meat. Leave to “maturing” 20-30 minutes. * Fry them in fat on both sides until browned – first with the skin side down, then the other side. 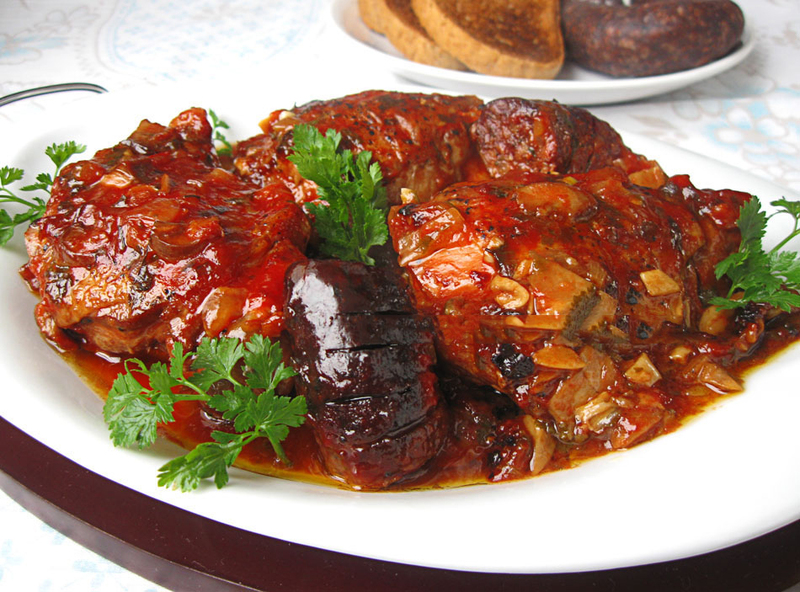 Caramelized meat penetrates into it and strengthens its aroma. This procedure is good to be done at once in a large, wide pan, but otherwise the one – fry into two parts. * In the same oil in the pan sauté chopped onion and garlic, then 3-4 min. Add the mushrooms, mushrooms and parsley, chopped. Fry for a minute. So put one by one fragrance products they build on during the cooking around the stove receives a magical scent of fragrances . * Add: tomato paste, wine and canned tomatoes – must pass through a sieve or strainer to be able to separate the seeds that are not particularly pleasant to eat. * All boil for 15-20 min., While the quantity remains half. * Add salt to taste, if tomatoes have not added salt and sugar spoon. * Prepared sauce is poured on the meat, place and sausage, cut into pieces. And here in the sauce are added each 2 cloves garlic – chopped or pressed. It is very important that the sauce to not be above the level of the meat, so as not to obtain as boiled. It is best to 2/3 of its height.